Our affiliate program is the easiest way to refer potential clients to NDMS. Fill out the form below and we'll send you a customized link that can be used on your website, blog, newsletter, or sent via email. The fields below are optional. You will be able to choose your unique URL and add a logo later. 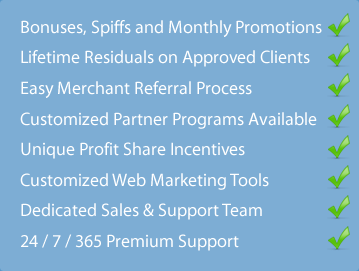 NDMS' Affiliate Referral Partner Program is a true revenue sharing program that provides substantial bonus opportunities, monthly residuals, confidentiality and complete sales and support for your customers. Bonuses and residuals will be paid based on the tables outlined below. 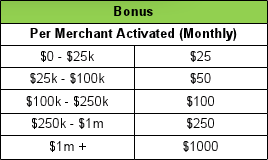 Bonuses are paid after Merchant has activated an account. Residuals are paid when monies are collected from the Merchants' processing. Payments will be submitted on or around the twenty-fifth day of the month following the month of collection. Residuals are equal to a percentage split multiplied by Net Income. Net Income equals revenue received by NDMS attributable to Merchants submitted by Affiliate to NDMS minus all NDMS costs and any amounts owed to NDMS under this Agreement. Minimum merchant pricing may apply and other costs and/or percentage splits may apply pending a merchant's industry and/or risk levels. Pass Through Fees: With regard to new or increased costs to NDMS, including but not limited to risk, interchange fees, assessment fees, support fees, and non-qualifying card surcharge fees, NDMS reserves the right to pass through to Agent or Merchants, as appropriate, such increased or additional costs. If possible, NDMS will provide to Affiliate advance notice of such increases. This Referral Agreement ("Agreement") is made effective as of the date approved by by Eichner Group, Inc. d/b/a National Discount Merchant Services, with principal offices located at 12335 Santa Monica Blvd, Suite 310, Los Angeles, CA 90025 ("NDMS") and submitted by affiliate partner identified herewith in or attached to this agreement by electronic means ("Source"). WHEREAS, NDMS provides credit card, debit card, ACH, POS equipment, software and related good and services (the "NDMS Services") and NDMS wishes to expand its market share by retaining Source to assist in marketing its NDMS Services by having Source provide contact information for persons or entities wishing to purchase the NDMS Services ("Leads") from NDMS. Appointment. Subject to the terms and conditions of this Agreement, NDMS hereby appoints Source as a provider of Leads to NDMS. Source shall interact with entities and individuals in order to obtain information from them as to whether they are interested in purchasing the NDMS Services. Source acknowledges that all Leads are to be approved by NDMS in its sole discretion and Leads will be able to utilize the NDMS Services effective only upon such approval. Royalty Payments. Source shall be entitled to receive compensation under this Agreement in accordance to Schedule A, which is made part of this agreement and may be amended from time to time at the sole discretion of NDMS, for so long as NDMS is receiving its corresponding compensation for such Leads and unless Source commits a material breach of the terms of this Agreement which will terminate any further right Source has to receive compensation. For any charges NDMS is unable to collect from the Leads NDMS shall have no duty to pay any compensation to Source under this Agreement. 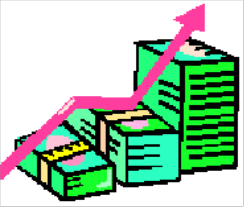 No fees shall be paid for Leads where Leads cause any losses or negative income to NDMS. U.S. Domestic Affiliates: all affiliates are required to submit a W-9 tax form. International, Non U.S. Affiliates: all Non U.S. affiliates are required to submit a Certificate of Foreign Status of Beneficial Owner for United States Tax Withholding Form or W-8BEN. Independent Contractors. The relationship of NDMS and Source is that of independent contractors. Neither Source nor Source's employees, consultants, contractors or agents are agents, employees, partners or joint ventures of NDMS, nor do they have any authority to bind NDMS by contract or otherwise to any obligation. Source agrees to comply with all NDMS policies and rules and Industry Association Regulations. Term. The initial term of this Agreement shall be for a period of two (2) years, commencing on the date first set forth below. This Agreement shall thereafter be automatically renewed for additional terms of two (2) years each unless either party notifies the other no later than ninety (90) days prior to the end of the current term that it does not wish to renew this Agreement. During the term of this Agreement, Source, its principals and its affiliates shall not enter into any agreement to refer or solicit Leads for any competitor of NDMS, including a direct relationship with any of NDMS' vendors. Indemnification. Source agrees to indemnify, defend, and hold harmless NDMS and its employees from and against any loss, liability, damage, penalty or expense (including attorneys' fees, expert witness fees and cost of defense) they may suffer or incur as a result of (i) any loss incurred by NDMS due to the negligent or fraudulent conduct of Source; or (ii) any breach of this Agreement by Source. Non-Solicitation of Leads. Without NDMS' prior written consent (which consent may be withheld in NDMS' sole and absolute discretion), Source shall not knowingly cause or permit any of their employees, agents, principals, affiliates, subsidiaries or any other person or entity to solicit or otherwise cause any Lead that has been accepted by NDMS or its vendors to terminate its participation in any of the NDMS Services. Neither Source nor any principal of Source will, directly or indirectly, enter into any agreement with Member Banks, NDMS' vendors, or NDMS front end authorization and back end network without NDMS' written consent. This section shall apply during the term of this Agreement and for three (3) years after any termination, cancellation or expiration of this Agreement. A. 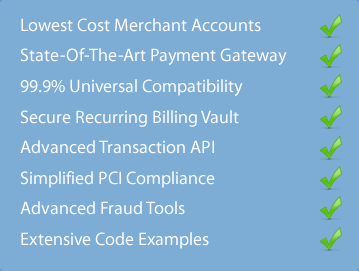 Affiliates cannot compete with NDMS’ market in providing merchant account services, credit card processing software and equipment, and cannot in any manner advertise as a competitor for "merchant accounts," "card processing services," "card processing equipment," or any other industry related terms, products, or services on any search engine (such as Google, MSN, or Yahoo!) for the purpose of generating leads. B. Cookie length - ninety (90) days. NDMS may track referrals by the use of browser cookies. The life span of the cookie is ninety (90) days, which means that if a user returns to our website within 90 days and contacts us, that referral will still be attributed to your account. C. Duplicate referrals. Once a business is recorded as a lead in our CRM system, the lead belongs to the referring affiliate for three (3) months. If the same business is referred by a 2nd affiliate during these three (3) months, this is not considered a valid lead, and will not show up in any referral statistics. If the business is not approved for a merchant account by NDMS during the three (3) months, the business is eligible to become a valid lead again. Posting to any inappropriate newsgroups that do not allow business content. Using the "NDMS" name in any unsolicited communications. Improper or erroneous tracking implementation by affiliate, including but not limited to the use of iframes, misspelled affiliate URL, multiple URL re-direction, etc. This Agreement will bind and inure to the benefit of each party's permitted successors and assigns. Source may assign this Agreement with the written consent of NDMS. NDMS may assign this Agreement in its sole discretion without the written consent of Source. This Agreement sets forth the entire agreement and understanding of the parties hereto in respect of the subject matter contained herein, and supersedes all prior agreements, promises, covenants, arrangements, communications, representations or warranties, whether oral or written, by any officer, partner, employee or representative of any party hereto. No amendment or modification to this Agreement, nor any waiver of any rights hereunder, shall be effective unless assented to in writing by both parties. This Agreement shall be governed by and construed in accordance with the laws of the State of California (irrespective of its choice of law principles). The parties hereby agree that any suit to enforce any provision of this Agreement or arising out of or based upon this Agreement or the business relationship between the parties hereto shall be brought in federal or state court in Los Angeles County, California. In any action arising from the alleged breach of this Agreement, or to enforce this Agreement, the final prevailing party will recover its reasonable attorneys' fees, costs and expenses. NDMS disclaims all warranties, express or implied, including but not limited to the implied warranties of fitness for a particular purpose and merchantability. NDMS shall have no liability in contract, tort, negligence or otherwise to Source or any other third party arising out of any of products or services provided under this Agreement. NDMS shall not be liable to Source or any third party for any liquidated, indirect, consequential, exemplary or incidental damages (including damages for loss of business profits, business interruption, loss of business information, and the like) arising out of this Agreement even if NDMS has been advised of the possibility of such damages. The failure of either party to this Agreement to object to or to take affirmative action with respect to any conduct of the other which is in violation of the terms of this Agreement, shall not be construed as a waiver of that conduct or any future breach or subsequent wrongful conduct. If any part, term or provision of this Agreement is declared and determined by any court or arbitrator to be illegal or invalid, such declaration and determination shall not effect the validity of the remaining parts, terms or provisions. The various headings in this Agreement are inserted for convenience only and shall not affect this Agreement or any portion thereof. This Agreement may be executed in two or more counter-parts and/or by fax, each of which shall be deemed an original, all of which together shall constitute one and the same instrument. The signatures to this Agreement may be evidenced by facsimile copies reflecting the party's signature hereto, and any such facsimile copy shall be sufficient to evidence the signature of such party as if it were an original signature. All representations, covenants and warranties shall survive the execution of this Agreement, and sections 5, 6, 7, 8, 9, and 10 shall survive termination of this Agreement. By submitting an Affiliate Program Request electronically, I acknowledge that I have also received the Agreement, either by receiving a physical copy or by viewing the Agreement at www.ndmscorp.com/affiliate-agreement or otherwise viewing an electronic copy. I have read the Agreement and understand it. I understand that the Schedule A is incorporated into this Agreement and that both documents constitute my contract with NDMS, whether I have viewed the Agreement online or have received a physical copy of the Agreement. I understand and agree that by viewing the Agreement online, I have acknowledged delivery of the full Agreement with the same force and effect as if I had received a physical copy of the Agreement. I declare under penalty of perjury under the laws of the state of California and under the laws of the state in which my business is located that all of the information contained in this Agreement and all attachments thereto are true, correct and complete. I understand that it is my obligation to obtain and retain a current, complete and correct copy of the Agreement, and to periodically view the Agreement at www.ndmscorp.com/affiliate-agreement to be advised of any changes to the Agreement. I also understand that I can obtain a copy of the Agreement directly from NDMS.